Accueil Produits Bande originale La bande originale de “Mission to Mars”. Sortie : 14 mars 2000. 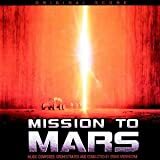 Film : Mission to Mars. Heart Beats in Space – 7:58. A World Which Searches – 2:58. And Afterwards ? – 6:32. A Wife Lost – 3:26. Towards the Unknown – 8:14. Ecstasy of Mars – 2:57. Sacrifice of a Hero – 13:19. An Unexpected Surprise – 2:32. All the Friends – 2:39.